Emaar Properties and Dubai Holdings have announced a new retail and leisure “metropolis” for the Emirate that is set to dwarf existing locations. Even by Dubai standards, this is set to be big. Dubai Square will be the equivalent to the size of more than 100 football pitches - with over 750,000sq.m (8.07 million sq.ft) of gross floor retail - almost twice the gross leasable area of The Dubai Mall. The project will be part of the Dubai Creek Harbour, a “mega-development” featuring 940,000sq.m of retail space, located 10 minutes from Dubai International Airport and adjacent to the Dubai Creek Tower, which is an ambitious new structure slated to be 100m taller than the Burj Khalifa. The new mall is attempting to ”blur the boundaries of online and in-mall shopping” and hopes to be able to buck the global trend of a shrinking retail industry. It is designed for the new era of customers, digital, connected and tech-savvy, and hopes to set a benchmark for retail experiences in the 21st century. Abdulla Al Habbai, chairman of Dubai Holding, said: “Dubai is experiencing tremendous tourist inflow and continues to rank highly as a holiday destination for people from many different parts of the world. The city’s appeal is anchored in its strong leisure and entertainment, retail and hospitality industry, the foundations of which Dubai Holding helped build and strengthen over time. Dubai Square will feature a mixture of styles and references, with inspiration coming from cities around the world. It will be linked directly to the Dubai Creek Tower through an underground extension. Due to spread across three levels, each will attempt to offer a unique set of experiences to visitors. Skylights, glazed roofs and shop fronts will be complemented by parks, patches of green and lush landscaping. Contrasting this will be LED technology driving interactive backdrops across the complex. Dubai Square’s ground floor will feature an events arena with a broad spectrum of event spaces on streets and alleys. The first floor has a four-lane boulevard lined with luxury retail, dining and leisure outlets. The second floor is where most of the entertainment will be located. 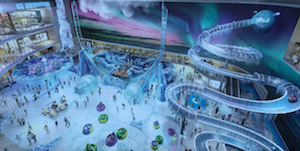 Ice Adventure (pictured) will be an ice themed area with a plethora of attractions, to operate alongside a Cineplex, waterpark, VR area and a sports arena. Other family-friendly activities include children’s edutainment and adventure facilities, and a host of gaming and high-tech play areas.